Bright lights, big city. Singer Jimmy Reed didn’t necessarily write those lyrics in reference to Las Vegas but it encapsulates Sin City pretty well. The ching of the slot machines, the gurgle of fresh beer being poured into pristine pint glasses and the laughter and noise of people thinking they’re on the precipice of winning their millions – anything is possible in Vegas! It transports you to a place where one minute you can be dancing alongside bikini-clad party goers, the next eating 800 feet above the brightly-lit city. You can cross oceans and country borders too. 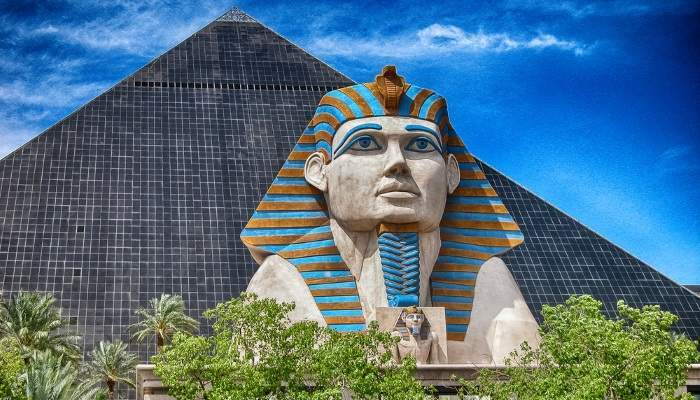 With the supersize hotels inspired by cultures from Italy to Egypt, see how you could tick off your must-visit travel list without having to board a single flight! 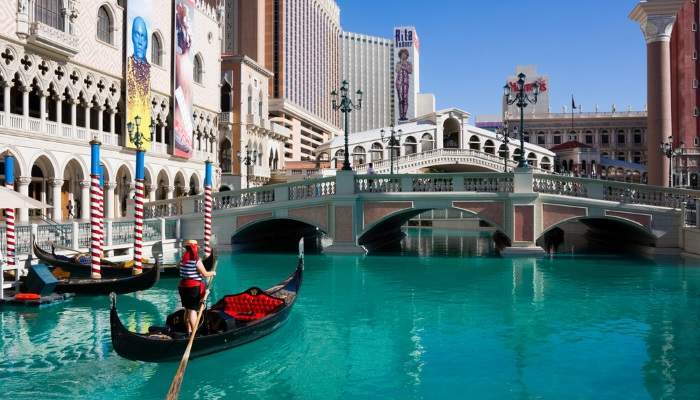 You’ll find Italy planted right on The Strip in the aptly-named Venetian Hotel. The city of Venice has been expertly recreated within its walls. With blue skies above your head and people meandering down scenic canals aboard gondolas, you’d be forgiven for thinking you’d actually booked a holiday to Italy. Lean back and relax as the gondolier sings over your tour of the likes of the Rialto Bridge and the Bridge of Sighs. The telltale sign of where the Luxor stands is the beam of light projected above it. Well, that and the massive pyramid-shaped building. Everything is overseen by a massive sphinx, just to propel you further into this Egyptian mirage. Next stop is the east coast of the US – step into the Big Apple at the New York-New York Hotel. 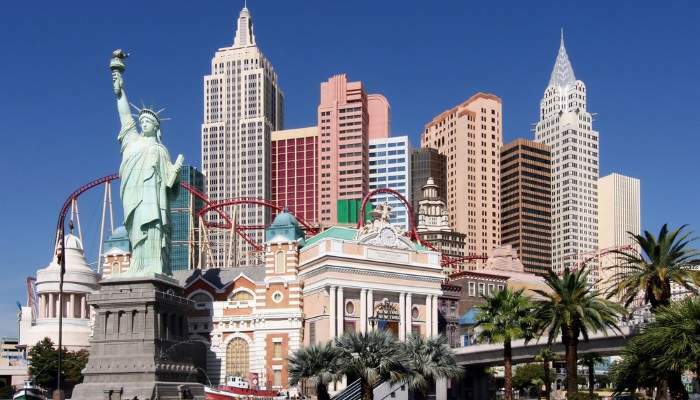 The hotel itself imitates the skyline of the inimitable city of New York, complete with familiar sights such as Brooklyn Bridge, New York harbour and a 150-foot replica of the famous Statue of Liberty. Hop on the roller coaster that goes straight through the heart of it all (even through a 180-degree spiral). 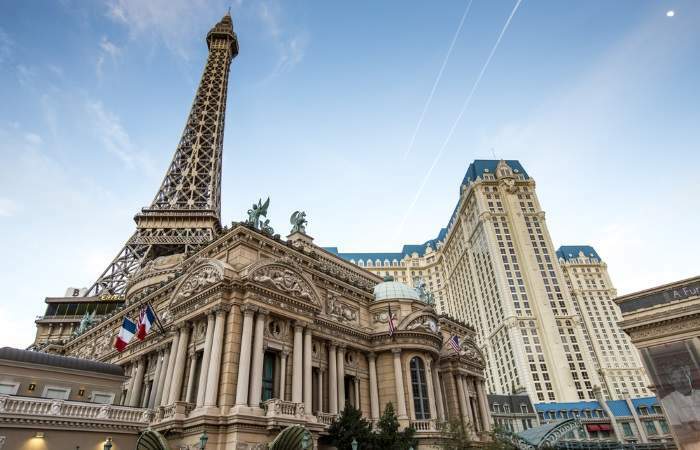 You may not have expected to visit the romantic City of Lights while exploring the brash and loud landscapes of Las Vegas but nevertheless you can get a European twist to your American adventure. The Paris Hotel is easy to pick out – just make a beeline towards the Eiffel Tower (made to scale!). Head further down and you’ll see the Paris Opera House has been recreated for your viewing pleasure. There’s also an Arc de Triomphe building and the casino looks like the front of the Louvre. Dine at the top of the Eiffel Tower for some great views – the only give away you’re not in the French capital is the views of the Strip. Italy makes another appearance at the Bellagio. 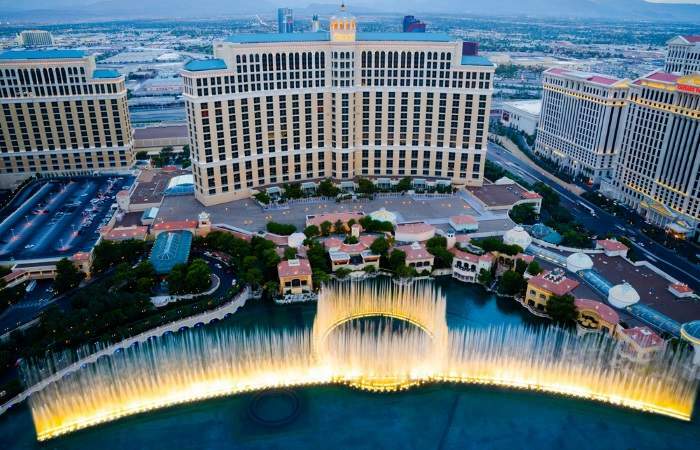 Everyone knows about one of Vegas’ greatest free shows at the Bellagio fountains but you may not know the design was inspired by the Lake Como town of Bellagio. Take in the water show on an 8.2 acre lake, synchronised to music, and tick off both Lake Como and the Bellagio fountain show off your bucket list. Perhaps not exactly inspired by Mandalay in northern Myanmar, but you’ll still feel like you’ve entered a faraway, tropical destination when you step through the Mandalay Bay’s doors. Make a beeline for the Shark Reef Aquarium. 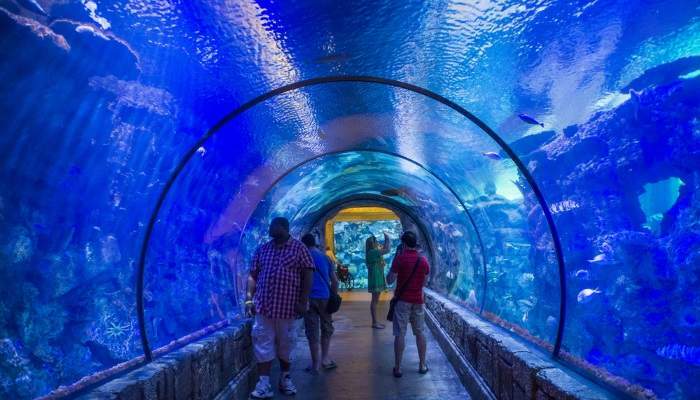 You’ll find a 1,300,000-gallon tank that’s home to sharks, fish, rays and reptiles. In fact, about 100 sharks from 15 different species and more than 2,000 animals are there right there in front of your eyes. Definitely take a walk through the Shark Tunnel! Ok, so this is mildly cheating – you’re not technically visiting a destination but you are travelling back in time and that’s just as cool. The Excalibur Hotel probably wouldn’t impress any historian with its accuracy but it’s still a lot of fun. You can’t really go wrong with brightly coloured turrets and towers. (Don’t worry – the hotel amenities aren’t in line with the medieval theme). 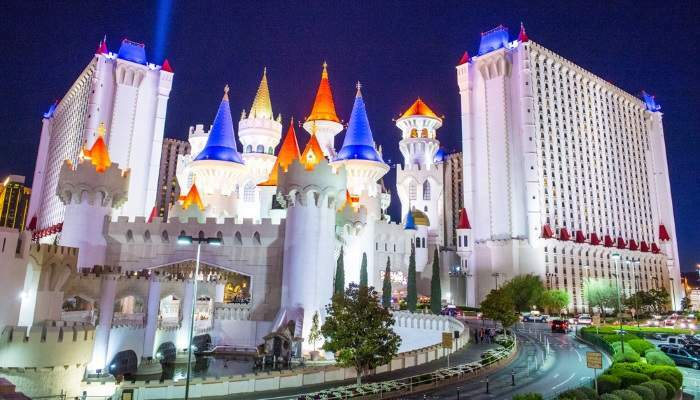 Want to go see the world through the eyes of Las Vegas? We can help find great deals on flights, holidays and hotels!